Supported by National Natural Science Foundation of China (81830085, 8177110318). Abstract: Objective To explore the role of curcumin in inducing autophagy and apoptosis of human hepatocarcinoma cell line Huh7, and the effect of autophagy inhibition on curcumin-induced apoptosis. Methods Human hepatocarcinoma cell line Huh7 was cultured using curcumin (5, 10, 20, and 40 μmol/L)-contained medium, and the proliferation ability was detected by CCK-8 kit. After culturing Huh7 cells using 5-40 μmol/L curcumincontained medium for 48 h, the expression levels of microtubule-associated protein 1 light chain 3 (LC3)-Ⅱ and LC3-Ⅰ were measured by Western blotting, and the ratio of LC3-Ⅱ to LC3-Ⅰ was calculated. The autophagosome was observed under fluorescence microscope. The apoptosis level of Huh7 cells was measured by flow cytometry. Then Huh7 cells were cultured using the medium containing 5 mmol/L autophagy inhibitor 3-methyladenine (3-MA) and 20 μmol/L curcumin, and the apoptotic and autophagic levels were detected. Results CCK-8 assay showed that curcumin could significantly inhibit the proliferation of Huh7 cells in a dose dependent manner (P < 0.05, P < 0.01). 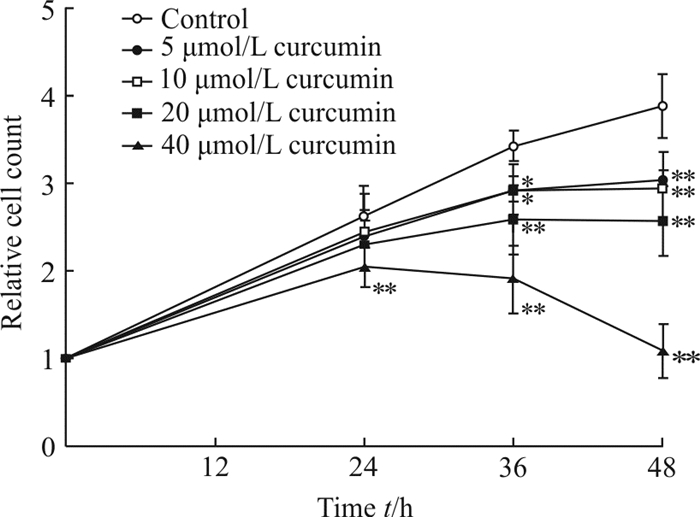 Western blotting analysis showed that curcumin significantly increased the ratio of LC3-Ⅱ to LC3-Ⅰ (P < 0.05, P < 0.01). Immunofluorescence microscopy showed that the number of autophagosome increased after adding 20 μmol/L curcumin. Compared with the Huh7 cells cultured with the medium containing curcumin alone at 20 μmol/L, the the ratio of LC3-Ⅱ to LC3-Ⅰ was significantly decreased in the Huh7 cells cultured with the medium containing curcumin and 3-MA (P < 0.01), and the number of autophagosome decreased. Flow cytometry showed that the 5-40 μmol/L curcumin significantly induced the apoptosis of Huh7 cells (P < 0.05, P < 0.01), and 3-MA combined with curcumin could significantly decrease the apoptosis of Huh7 cells compared with 20 μmol/L curcumin alone (P < 0.05). Conclusion Curcumin induces the apoptosis of Huh7 cells, inhibits proliferation and increases autophagy level, and inhibition of autophagy can attenuate the apoptotic effect of curcumin on Huh7 cells. BOSE S, PANDA A K, MUKHERJEE S, SA G. Curcumin and tumor immune-editing: resurrecting the immune system[J/OL]. Cell Div, 2015, 10: 6. doi: 10.1186/s13008-015-0012-z. LIU F, GAO S, YANG Y, ZHAO X, FAN Y, MA W, et al. Antitumor activity of curcumin by modulation of apoptosis and autophagy in human lung cancer A549 cells through inhibiting PI3K/Akt/mTOR pathway[J]. Oncol Rep, 2018, 39: 1523-1531. DOHERTY J, BAEHRECKE E H. Life, death and autophagy[J]. Nat Cell Biol, 2018, 20: 1110-1117.